Fashion Maven... Mommy: Help Armour Beauty Select their Holiday Collection! Help Armour Beauty Select their Holiday Collection! So you've heard me profess my love for Armour Beauty Lip Glosses in a previous post! I swear I rock 'Nina' all the time! So Armour Beauty launched a very cool social media contest in hopes that you, the consumer, can help them select their holiday collection! There are three gorgeous options to choose from! 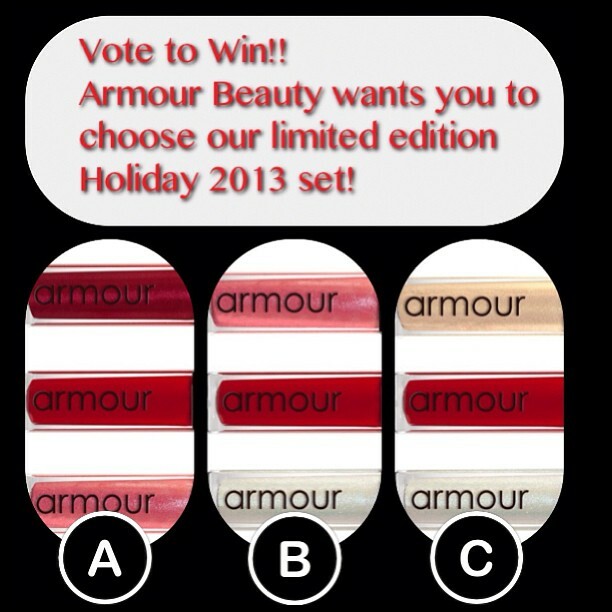 The option with the most votes will be Armour Beauty's official holiday launch. Enter now and you could be one of three lucky winners to take home the winning collection!!! How do you enter you ask? Well, simply 'like' Armour Beauty on Facebook, follow them on Twitter, or follow them on Instagram. Then vote for your favorite collection by commenting "a, b or c". GOOD LUCK!!! Mostly mommy's are buying anti aging beauty products in social marketplace,as a beauty purpose Armour beauty products are very demanded in online.